The Apple III made its debut way back in May 1980 with a 2MHz Synertek processor and 128KB of RAM. Its launch was plagued by stability issues that meant over 14,000 units had to be recalled, and just four years later, the machine was discontinued. Apple sold less than 75,000 units during that time, so it’s incredibly difficult to find an Apple III today. But if you have fond memories of the machine, you can build a tiny replica that will lovingly house your Raspberry Pi. Charles Mangin shows us how in the YouTube video below. He starts by drawing things up in iDraw, then made 3D models in Autodesk 123D. The model was then send to a 3D printer to be created before the paint and finishing touches were applied. 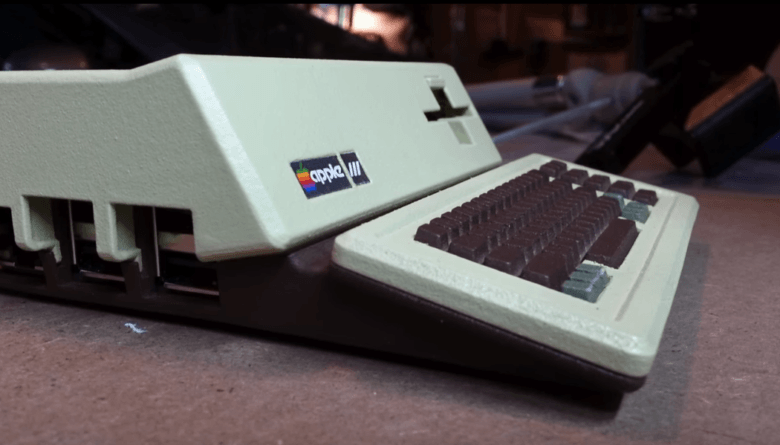 This obviously isn’t the easy Raspberry Pi case mod, but for long-time Apple fans, it has to be the coolest. You’re certainly not going to bump into anyone else whose Pi looks as good as this. This entry was posted in MacBiz and tagged Apple III. Bookmark the permalink.